1) How can I configure the proxmark to read a T5XX tag, when lf t55xx detect is unable to identify the tags configutaration (modulations, offset, rate)? 2) Why does lf t55xx bruteforce fail to identify the password eventhough it is in the default_pwd.dic ? 3) Can block 0 (containing the configuration) still be read even though password protected? 4) Is it possible that my tag is actually not all a T55xx? Any help would be greatly appreciated. Please let me know what other information I should provide. I'm new to this community. I decoded the payload sent by the blue cloner (data for block #0) and was able to determine (I think. Not entirely confident.) the tag's configuration. Nevertheless, I'm still unable to correctly read the contents. Could anyone help me out? I would expect to see 0x00148050. I've tried with different offsets, with no success. Nonvolatile Program Memory Size: 512K bytes. Used: 202493 bytes (39). Free: 321795 bytes (61). 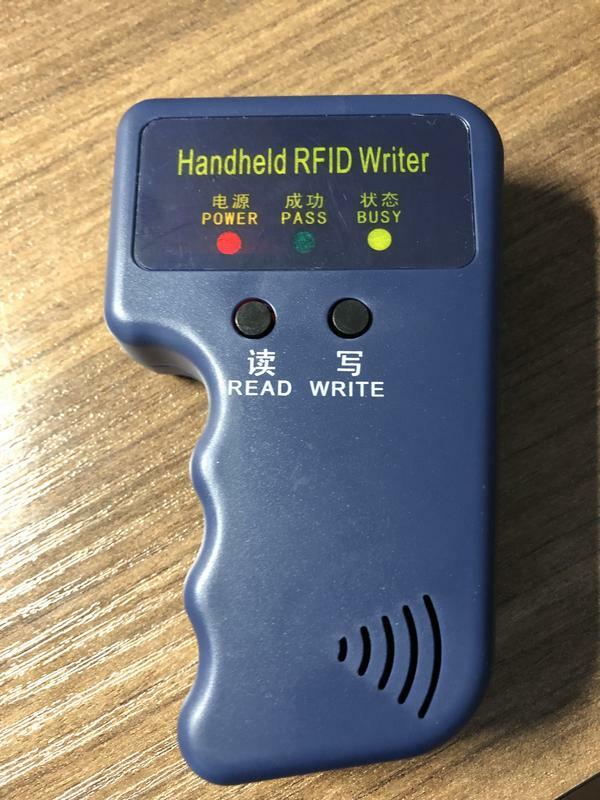 it is possible that your chinese cloner can write em4305 and your tag is.. Thank you for your suggestion. I had indeed tried out the em4305 commands with no success. My two main reasons for suspecting it is not an EM4305 tag are: the payload send by the reader matches surprisingly well to the programming protocol of a T55xx tag described in the datasheet. Second, according to the EM4305 datasheet, block 0 and 1 are not read protected. When I tried to read them, I just get a failed message. Have you ever captured the blue cloner's programming sequence? I'm curious to compare. Just wanted to update this thread with some progress I made. I finally took the time to decode every single pulse train / writing sequence the "blue cloner" transmits. In essence, my cloner transmits a total of 14 pulse trains separated by period in which the antenna is left "on" oscillating at 125kHz (there is probably a name for this, not really sure what to call it). This period is required by the tag finish programming after a write sequence is transmitted. Roughly the first half of the sequences assume the tag is protected and can be accessed with the password 0x51243648. The other half attempts to write the tag using normal no-password commands. The ID being written is 0x6A0016E5AB. Pulse 1 is a bit special, as it uses leading-zero reference protocol. (Enabling analog front-end by setting Option Key=0x6 and setting leading-zero reference protocol). It seems that by enabling the leading-zero reference protocol the cloner "soft-bricks" the tag, that is, with the latest public firmware, it is not possible to change the settings of block 3 page 1. I modified the write command on the proxmark to accept a 'z' argument and send the required reference and padding zeros. // Trigger T55x7 in mode. Except for a few differences in gap lengths, the proxmark emulates the cloner's first sequence. Yet, the contents of block 3 page 1 seem to remain unchanged. Any comments or insights would be greatly appreciated. most likely it is not the leading-zero reference protocol..
At this point I feel I'm going in circles. I managed to get my hands on a brand new T577. I used the cloner to copy the same UID (as in my previous entry) and was able to unlock it with a simple lf t55xx write b 0 d 001480E0 p 51243648 . This verified the decoded data of my last entry. Except for the analog front end, not sure whats is going on there. As I understand it, it should be in leading-zero protocol mode. I have no clue. My attempt to write the new block 0 data using leading-zero also failed. This proofs that the first tag I was using for testing (small blue key fob) is indeed not a T55xx tag. With this in mind, I took a longer capture of the cloner's write sequence with the oscilloscope. 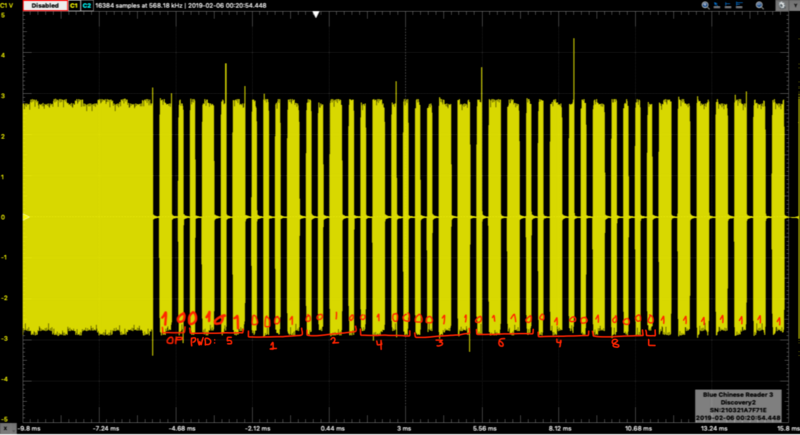 It turns out it sends more pulse trains after the ones I decode. Probably to write a EM4305? One of the pulse trains seems to be 96 pulses long! Can a EM4305 also produce a EM410x pattern? @anybody, you were probably right! Thanks! Yes it can. You just need to configure it correctly. Now em4305 keyfobs can be especially difficult to communicate with with the pm3. A properly tuned and sized antenna is your friend. I'm interested in why the pm3 write command looks like a fish when all the traces of the cloner are nice and square. Is that a good capture? @danv, it's not em4305, most likely it's t55xx..
Can you attach another 3 long traces from your Chinese cloner (each must be 69 bits, starts from 01)? Sorry that it took me this long to reply. @anybody: I surely would appreciate your help with these tags, although I'm not sure how they could be T55xx tags, they do not respond to any command. I just ordered some EM4305 from AliExpress to compare how they behave. I uploaded traces as pictures. There are 3 folders, each containing a set of sequences, each set of sequences is separated by a 'long' period of the field being ON (not shown), that is, with no write data. Additionally I included the entire trace as a WAV file, viewable with Audacity. Folder A contains captures of T55xx write commands (the ones I showed in my earlier post). I have not managed to decoded the sequences contained in folders B & C.
The problem is that all the tags that came with this cloner behave the same way. In other words, non of them are empty, they all contain the same EM TAG ID 3D00D51E2C. I'm only able to write them using the cloner. Quite puzzling. I think the vendor might have tested all of them, some sort of quality control. I confirmed the sequences on folder B are valid EM4305 write commands. If the tags were EM4305, the password being set would have been 0x9F3BD705. So, is there any other tag that can emulate a EM410x? Could the traces be a strange configuration of the T55xx/EM4x05? Is EM TAG ID 6A 00 16 E5 AB ? Yes! Sequence 2 & 3 encode the EM ID 6A 00 16 E5 AB, including initial 0b1 + 0xFF and parity bits. All sequences begin with 0x4, might be the op-code? If you take a look at the entire capture (wav file), it is clear that the tag is responding to this commands (sequences C), contrary to the sequences A (T55xx) & B (EM4x05), where the tag goes into regular read mode immediately after the sequence ends. Most likely, it's t55x7 test mode (opcode "01"). But I did not find any information about this mode. Sorry for taking so long to reply . I did what you suggested. I wrote a blank T55xx tag with 0xFFFFFFFFFF and copied to one of the unknown tags using the cloner. I decoded once more the cloner write sequences. I XOR'ed the write sequences (C) of 0x6A0016E5AB and 0xFFFFFFFFFF. I've marked my assumption for the page bit. Sequence 1 and 4 are identical for both. My intention is to simulate this write sequence with the proxmark and fuzz some bits. My first attempt will be to swap blocks.